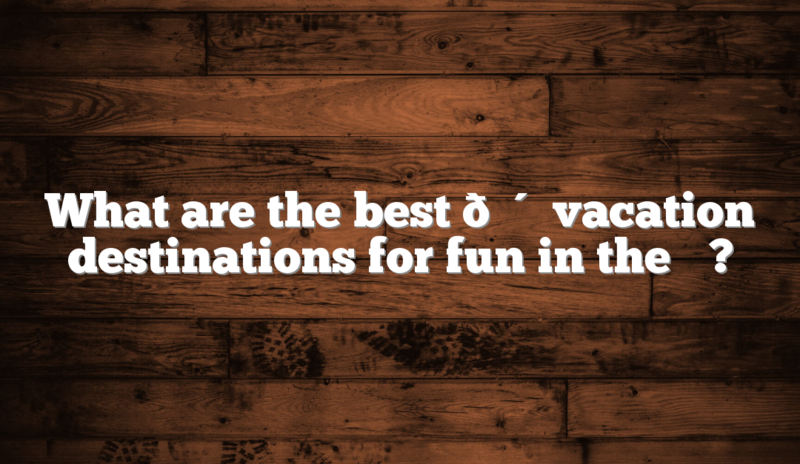 What are the best ☀️☀️☀️☀️☀️ vacation destinations for fun in the ☀️? There are so many places in the world to see, that I often wonder what the best vacation destinations are for tropical weather ? . Here are a few that I found online, but I’d like to hear from the comments section about which destinations everyone loves. There are so many beautiful, tropical sights in South America. Brazil is one of the most popular destinations in all of South America due to the beautiful beaches, amazon rainforest and welcoming community. If you´re going to travel to South America, you ought to see several of the highlights. Machu Picchu is nearby the Galapagos Islands, after all, so it makes sense to combine a Peru and Ecuador tour. Or you could join together the Iguassu Falls, Rio de Janeiro, and Machu Picchu into one itinerary. With our expert travel consultants, it’s easy to create customized South America tours that suit you perfectly. In the pacific islands there are many different beautiful vacation destinations. Fiji is one of the best places to visit in the Pacific Islands. Fiji easily conjures images of escapism and indulgence – perhaps because some of the most popular Fiji vacation destinations are its exclusive private-island resorts. But Fiji is an island nation with many accommodation types, including large family-friendly resorts around Nadi & Denarau Island and along the Coral Coast, dive-centric outposts in the Mamanuca and Northern Islands, and, of course, those intimate Outer Island properties where the focus is on privacy and passion. The Caribbean is a favorite destination among american travelers. You can travel to the Bahamas much faster than a trip to Fiji or Tahiti. Beautiful beaches and awesome sunsets make this a tropical destination that you should visit at least once in your lifetime. That’s all the destinations that I could think of. Where would you travel for fun in the sun ☀️?